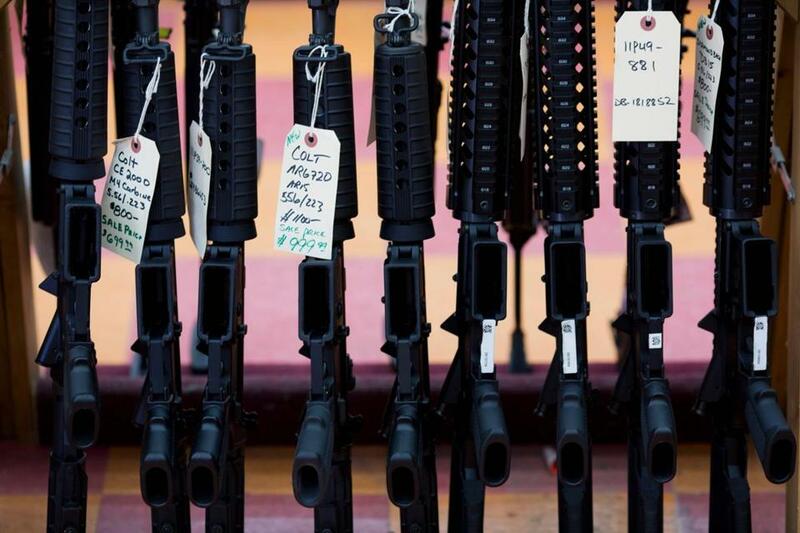 Rifles for sale at a gun shop in Merrimack, N.H. Support for background checks for gun purchases and a ban on sales of assault weapons have reached new highs among US voters. Mass shootings have become an epidemic. There’s no other way to describe the carnage we regularly face. But where past tragedies have slipped out of the news and no action has been taken, this time we’re seeing leadership and persistence by the brave high school students who survived the shooting in Parkland, Fla. These young men and women have boldly assumed the mantle of moral leadership. Just days after burying their friends and teachers, they are demanding that lawmakers, at the state and national levels, take action to reduce the likelihood of another mass shooting. Fortunately, at least one approach has had real results: a federal ban on military-style assault weapons. This strategy worked in the past, when Senator Dianne Feinstein of California championed and gained enactment of a ban in 1994. Unfortunately, opponents in and out of the Congress are speaking out against a ban. They advance three arguments: The ban didn’t work; it’s too complicated to put into legislation; and it prevents law-abiding citizens from buying guns. They’re wrong on all counts: The ban was effective and, if enacted, will be again; in the realm of public safety, Congress regularly acts on complex matters; and no one has an absolute right to buy any and all guns. In evaluating an assault weapons ban, it’s important to keep in mind that the goal was and is to decrease the frequency and deadliness of mass shootings; neither a ban nor any other single action will end such shootings altogether. Common-sense state-by-state reforms can save lives. Given the intensity of emotion on the issue, it’s not surprising that both sides point to studies that support their position. But one analysis, by Louis Klarevas, a professor at the University of Massachusetts, is persuasive. He found that mass shootings fell by 37 percent during the ban and then increased by 183 percent after it lapsed. Also, gun deaths from mass shootings fell by 43 percent during the ban, and then increased by 239 percent afterward. The 10 deadliest mass shootings in our country’s history all occurred either before or after the ban was in effect. And today, as weapons become more sophisticated and deadly, casualties have increased. The second argument is that the circumstances are too complicated to permit the writing of an effective ban; how, opponents ask, will Congress decide which weapons to ban? However, in limiting the emission of toxic chemicals, in evaluating the benefits and dangers of prescription drugs, in making airplanes and automobiles safer, in trying to prevent another financial crisis, Congress has dealt with complexities more daunting than the classification of assault weapons. The third argument is that an assault weapons ban will prevent law-abiding citizens from buying some guns. But that already is the law with respect to a wide range of military-style weapons, including fully automatic machine guns. The central question is whether an AR-15 is closer on the spectrum of weapons to a machine gun or to a hunting rifle. The answer is obvious. In renewing the ban, in addition to expert knowledge and advice about weapons, what’s also needed in common sense. Common sense tells us that there are significant differences between an AR-15 and a hunting rifle. Common sense tells us that hunters don’t need 30 rounds in a magazine to bring down a deer. Common sense tells us that weapons of war should not be brought into our schools. The assault weapons ban reflects these principles in a straightforward and common-sense way, by identifying the characteristics that distinguish assault weapons from other firearms. I do not suggest that it is simple. I do suggest that it has been done and can be done again. This approach worked with the 1994 assault weapons ban. It can work again. The young men and women from Marjory Stoneman Douglas High School have earned our respect. We must tell them the truth and act on it. Renewing the federal assault weapons ban will reduce the likelihood of another tragedy like the one they went through. Congress should join the students in leading on this critical issue. George J. Mitchell served for 15 years as US senator from Maine, the last 6 years as Senate majority leader. He later served as chairman of the Northern Ireland peace talks and as US envoy for Middle East peace. He is currently chairman emeritus of the international law firm DLA Piper.